Welcome to another episode of "Fun, Weird Fruits"! While people who shop in Chinese markets will likely be familiar with jujube fruits (aka "red dates"), most of those who stick to the typical western grocery stores won't have encountered them. For those not in the know: Jujube fruits have been cultivated in China for thousands of years. Although they are sometimes called "red dates," they aren't related to dates. They grow on a deciduous tree that sports shiny oval leaves, naturally drooping limbs and thorny branches. Read on for selection notes, how to eat Jujubes, and a few recipe ideas. Common names include jujube, Chinese date, Chinese apple, tsao, Korean date and Indian date. Although jujube goes by many names including "Red Date," it is not a date, and is not related to the medjool and deglet dates you'll see in grocery stores. The name Red Date comes from the fruit's similarity in appearance and flavor, when ripe and dried, to dates. There are over 700 varieties of jujubes in China, and about 40 varieties in the U.S. When eaten fresh, varieties developed for drying will have a dry, mealy texture and won't be very sweet. 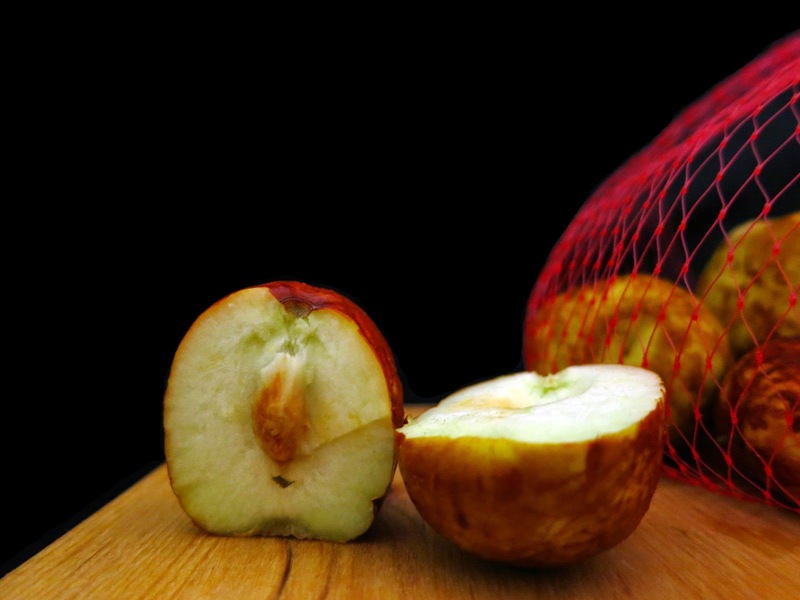 But varieties produced for fresh eating will have a crisp texture like an apple, and will be sweet and tasty; Unfortunately, varieties for fresh eating have only recently (1990's) been introduced into the U.S. and are not very common yet, so they will be more difficult to find. The size of jujube fruits varies depending on the variety. In stores, they're commonly oval shaped or roundish and about two inches long. Larger varieties exist, including 'Li' (3-ounce fruits), 'Shanxi Li' and 'Chico GI-7-62' (round fruit with flattened bottom). Young fruit is light green. As it ripens, it grows more yellow on color, and reddish-brown spots appear on the skin. 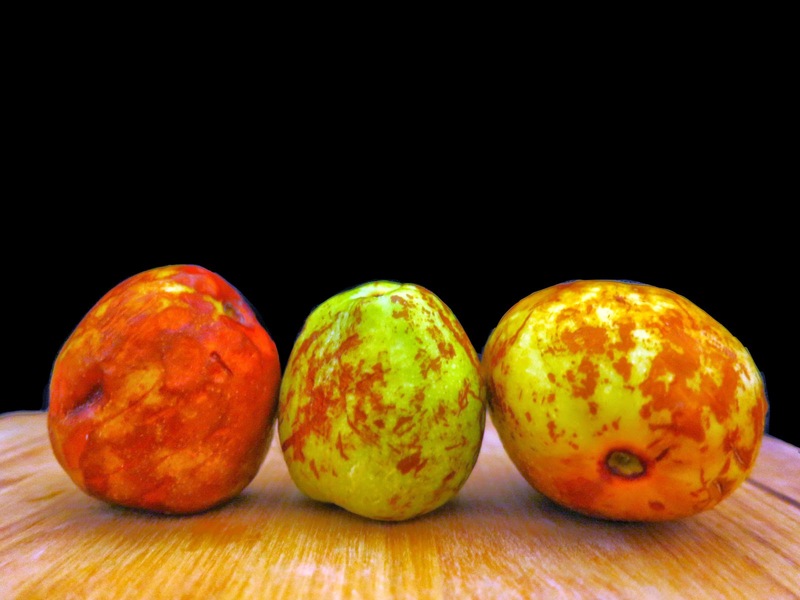 A fully ripe jujube is reddish-brown all over and slightly soft and wrinkled. For fresh eating, most people consume jujubes before the fruit become fully red, soft, and wrinkled: the fruit will be crisp, lightly sweet, and apple-like in texture. Store jujubes in the refrigerator. 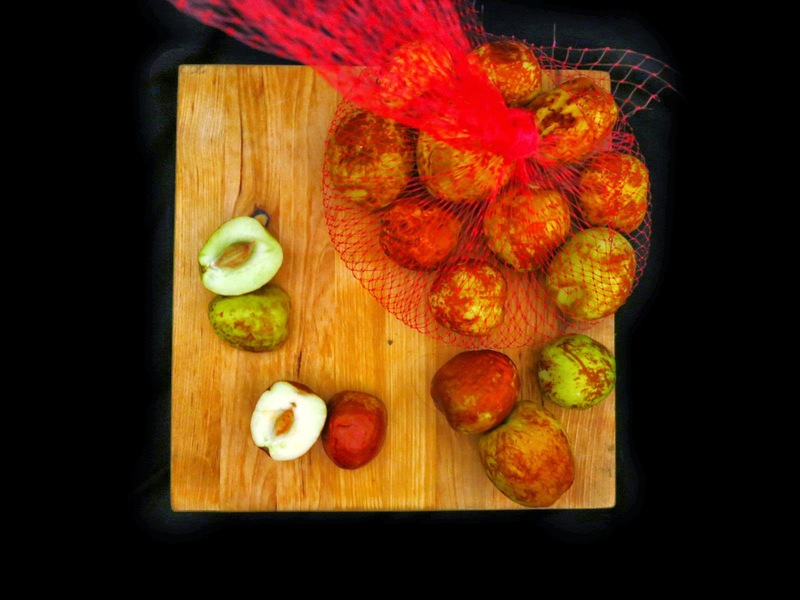 Jujubes are eaten fresh, dried, pickled, candied, made into the jujube equivalent of apple butter, made into syrups for sweetening teas and dishes, and pitted and preserved in liquor for use in cooking. You can use fresh jujubes in place of fresh apples in recipes, and you can use dried jujubes in place of raisins or dates in most baked goods. 3. Save the remaining jujube-infused water for the syrup recipe below. Place the remaining jujube liquid from the Candied Jujube Recipe in an uncovered pot and boil until it has reduced to about 1 1/3 cup. Visit your local Chinese grocery, if you have one, and keep your eyes peeled for these treats! You may also spot them at a local farmer's market if you live in California, Texas, or another state with a warm climate. You can also try growing a jujube tree yourself if you live in a hot, dry growing climate like that of Texas. The plant is incredibly hardy and thrives on little rain and high temperatures. So, how did I eat mine? I ate about half of them fresh and chopped up the other half to add to a hearty stew! Hope this inspires some of you to hunt down a few jujubes yourselves! Thanks for this post -- super helpful for a novice Chinese cook! You're welcome!! Thanks for letting me know it helped you! Very helpful! Have one of these trees in our new backyard, and wasn't sure how to use them. Thanks! Just bought some jujubes today - my acupuncture used to give them to me as part of me healing protocol :) I have yet to find them fresh though! I'll keep an eye out! I have 2 Jujube trees. I harvest them and cut fruit off of the pit, then freeze for later baking. I usually use them as I would fresh Apple. I will mix them with some chopped apple for a cake, it really does turn out good. You're welcome! I'm so glad you found this helpful. I also love growing my own food, and would love to have a satsuma and jujube tree of my own one day. Best wishes!